There are so many choices, one can hardly decide! Here are some of our own favorite activities and spots. Dufferin Terrace and its fairytale castle, two attractions that never cease to amaze visitors and locals alike. Perched atop the headland, Château Frontenac has stood overlooking the St. Lawrence River and Dufferin Terrace for over 100 years. 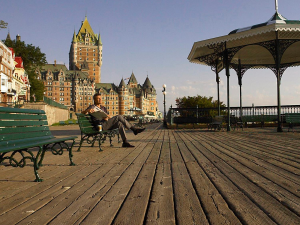 Stretching from the foot of the Citadelle to Château Frontenac, Dufferin Terrace offers breathtaking views of Île d’Orléans, the St. Lawrence River and Québec City’s Lower Town, making it a perfect spot for taking pictures. The narrow streets leading to Dufferin Terrace and Château Frontenac are oozing with charm and cachet and are well worth taking the time to explore. Rue Saint-Louis and rue Sainte-Anne are lined with renowned restaurants and delightful boutiques. 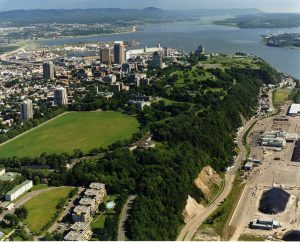 The Plains of Abraham are to Québec City as Central Park is to New York—a 98-hectare oasis of greenery in the heart of the city. The scene of many historic milestones over the centuries, the Plains today are the mainstage venue for headline cultural events. The Plains of Abraham were the site of the famous Battle of Québec in 1759, which saw the French and British troops face off in a fight for control of the city and the surrounding territory. The two armies clashed again several months later in the Battle of Sainte-Foy. Ultimately, the decisive British victory had a significant influence on Québec’s architecture, defensive works, and urban planning. Now Canada’s first national historic park, Battlefields Park, which includes the Plains of Abraham, was created in 1908 to mark the 300th anniversary of the founding of Québec. A jewel in the park’s crown, the Joan of Arc Garden is a delight for the senses, with over 150 plant and flower varieties on dazzling display. 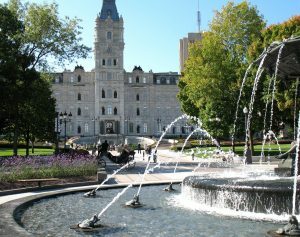 Dominated by the majestic outline of the Parliament Building and graced by a splendid fountain in its forecourt, Parliament Hill exudes style and elegance. The Parliament Building is home to the National Assembly, meeting place of Québec’s 125 elected representatives. The very first national historic site in Québec, the Parliament Building is an impressive structure whose four wings form a square measuring about 100 metres by 100 metres. Built between 1877 and 1886, its architecture, virtually unique in North America, is inspired by the Louvre Palace, making it one of the only French-style institutional buildings in Québec City. The Parliament Building and its grounds pay eloquent tribute to the men and women who marked the history of Québec. The building’s main façade boasts 26 bronze statues erected to the memory of key historical figures: founders, explorers, soldiers, missionaries, politicians, and colonial administrators. Fontaine de Tourny stands directly in front of the Parliament Building. The 7-meter-high fountain is especially stunning when lit up at night. Fontaine de Tourny was originally installed in Bordeaux, France, in 1857, only to be removed in 1960. Department store magnate Peter Simons stumbled across it at the Saint-Ouen flea market in Paris. At the time he was looking for a unique gift to make to the City of Québec for its 400th anniversary. He had the fountain shipped to Québec City in 2003, where it was restored before being presented to the city. Today it has become a must-see attraction. Not far from Parliament Hill stands porte Saint-Louis, a towering stone gate providing access to the walled town. Built in 1694, it was demolished and rebuilt on two separate occasions. Porte Saint-Louis leads on one side to Grande Allée, one of the city’s most prestigious thoroughfares, and on the other to Rue Saint-Louis and Château Frontenac. Walk around within the old city’s fortification. 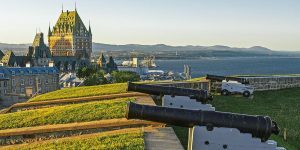 Visit the beautiful Citadelle, a national historic site and museum located atop Cap Diamant in Old Québec. Its walls enclose 300 years of history from the New France period to today. Known as “the Gibraltar of the Americas” on account of its strategic location, the Citadel has the star-shaped form characteristic of Vauban fortifications. Breathtaking view of the city and the St. Lawrence River. The Musée Royal 22e Régiment, located inside the Citadelle, recounts the history and values of the Royal 22e Régiment as well the Citadelle of Québec and place them in the context of Canadian military history. The Royal 22e Régiment is the only French-language infantry regiment in the Canadian Forces Regular Force. 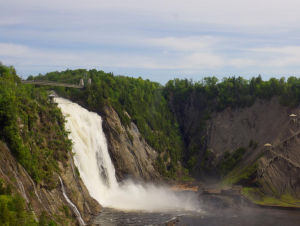 The Montmorency Falls Park, located just a few minutes from downtown Québec City, is one of the province’s most spectacular sites. The waterfalls are 83 m (272′) tall, a full 30 m (99′) higher than Niagara Falls. Take the cable car up the cliff to start the panoramic walking tour at the Manor, where are housed an interpretation centre, gift shop and restaurant. Follow the footpath along the top of the cliff to the suspended bridge, which affords a splendid view of the area. Keep walking along the path until you get to the 487-step staircase down the side of the cliff that will bring you to the foot of the falls. There are also three via ferrata routes near the falls. Don’t miss it!